I made this quick model in Family Editor with model lines and a couple of glass extrusions. It captures the essential geometry, and it was pretty quick to set up. There's a groin vault formed where a segmental barrel vault meets another barrel vault based on a partial ellipse. 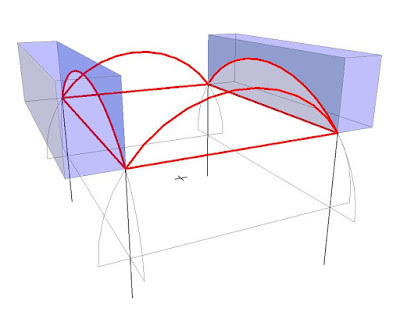 The critical factor is to have a common centre of curvature between the two vaults. That way they intersect nicely forming straight diagonals in a plan view. Here's a 3 dimensional version of that principle from a study I did a couple of months ago. And another snapshot from my first attempts to model the vault used for waiting rooms A & B between the Court Room and the Governor's Office. This shows how he converts a groin vault into his signature "Starfish" ceiling treatment. You have to shave off the corners at the intersection to create the arms of the starfish, culminating in a shape at the apex. In this case a circular hole for a skylight, but often a diamond shaped feature in the centre of the ceiling. Going back to the model line version I did tonight you can see that there are semi-circles at the ends, and half elipses at the sides. What Soane did then was to create narrow slots along the sides that shoot up to skylights bringing in light from above. (the blue extrusions in my earlier image) The plane of the centres of curvature for all 4 arches is shown as dashed lines. The geometry on which the actual vault is based is highlighted in red: much flatter than the waiting rooms version above. I'm starting to call him a Romantic in Workaholic's clothing. He worried away at his designs, going through multiple options before hitting on the right idea, in some ways he seems like a stubborn plodder almost, but he could be so fanciful, and many of his final designs are just stunning, especially in their treatment of light. I'm going to close with a shot of where those waiting rooms are. It's a section through both of them, looking North towards Tivoli Corner.. You can see the high level windows that bring light into the rooms, They show here as black shapes above black door openings. And just beyond is a high level window that brings light into the Governor's Room, just squeezing in below the red loop. Here is the current state of the model. It's fairly basic but you can get the idea of how the spaces work. Feel free to volunteer to join our group and help to add more detail. Actually these are all early works of his, from my childhood days. I get very nostalgic looking at these. I wonder if my children will get nostalgic about my Dubai pictures, 40 years from now. About a month ago, I took some pictures of the mish-mash of low-grade shops and apartment balconies that I see on my walk to buy some local fruit and veg. I live in International City, in fact I'm one of the pioneers who moved into this tacky/vibrant district while it was still under construction. Actually it's Dubai, so it's still under construction ... but it was barely half built when I moved in ten years ago. Lots of lorry drivers and nurses, receptionists, shop assistants, etc living here. It's not very stylish, but it's kind of "real" which is difficult to find in a theme park city. Here's what I did with one of the images. Exactly. Those are the kinds of questions I'm exploring. Trying to get more physical and intuitive, to reconnect with my submerged "drawing self", which used to be one of my primary identities. At the same time I want to integrate this with the digital tools and processes I've been using the last couple of decades. So you've go digital photography; hand sketching; layers, filters, transparency ... all mixed up together in a semi-accidental way while I focus my attention mainly on how to create an image that captures how I feel about this environment I live in. In a way it's not much different from Georges Braque mixing oil paint and newspaper clippings etc ,,, except a lot less innovative and significant of course. No big ambitions here, just me amusing myself as usual. One of the things about art, for me, is always the interaction between form an content. You keep flipping between the quality of the paint as "stuff on a flat surface", pure abstraction if you like, and the meaning: the emotions, the magical conjuring up of 3 dimensional reality, memories, social commentary. So I'm absorbed in technique: how to get the digital and manual working together convincingly. And I'm also deeply intrigued by what kinds of images I can use to capture the last 13 years of my life as an alien in the desert. I like the layers here. A series of stripes really. And it's kind of receding but it's also kind of flat and abstract. 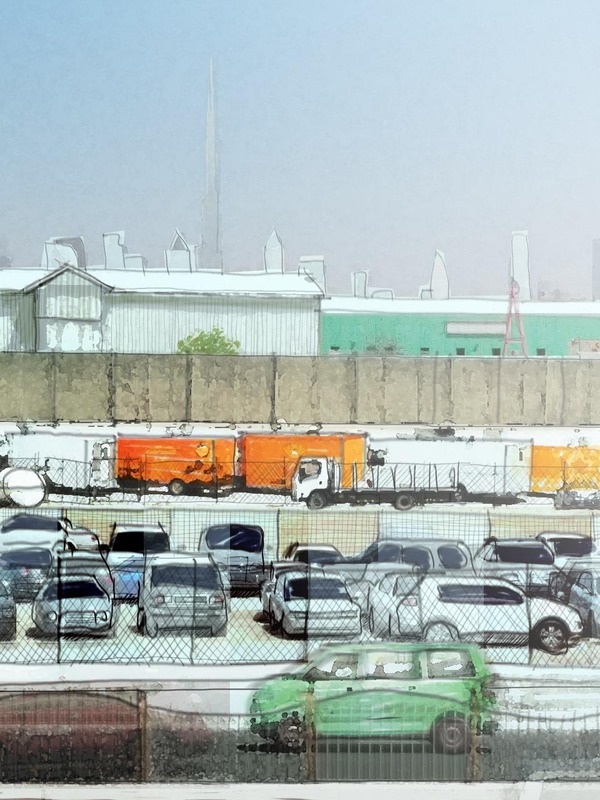 I've tried to create some kind of tension between the way different stripes are treated ... the blurring in the foreground (which is kind of a cheat) the rather sloppy line drawing of the second hand car lot, overlaid with the slightly more painstaking and mechanical cross hatching of the wire fence. 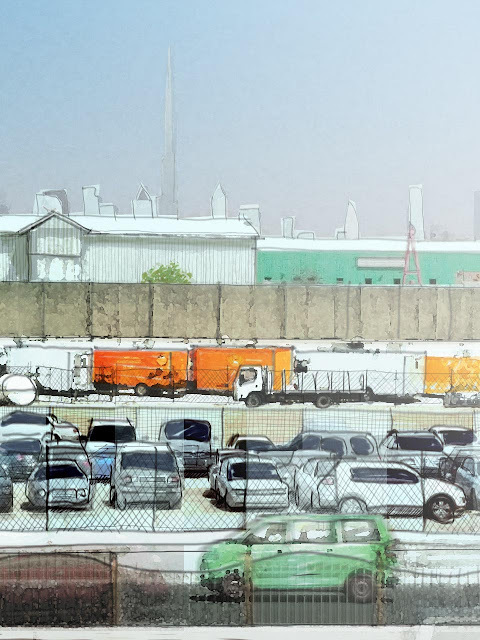 Then there's the somewhat palette knife feel of the orange box vans, jumping forward from the background. The cardboard cutout effect that emerged when I was working on the skyscraper skyline. Anyway I'm not trying to get all pretentious here. Just giving a feel for the stuff that flows across my consciousness as I struggle to get to grips with this activity. It's very different from building BIM models, and I really like that. Watch out for the next phase, when I start to sketch over Revit renders. "What's BIM about that ?" you may ask. Well if BIM is about gaining deeper insights and making informed decisions, then a different perspective might just help. If we have started to realise that BIM is really about connecting different software packages together in agile ways, so the "data flows". And if we also know that the hard part of BIM is the people, the human interactions, the deeply embedded behaviours ... maybe we need to integrate the more physical and intuitive type activities into the BIM loop. I'm back at work now, but still reflecting on a very stimulating two weeks wandering across Europe. Previous posts dealt with my weekend in Bavaria and the build up to RTC in Porto. Of course I fell in love with Porto, and though some complained about the venue (distance to hotels, poor wifi) I was more than happy to trade convenience for ambience. Conferences are primarily about people, so the mood of the moment is critical. Here is a shot from the riverside terrace of the old customs hall where RTC took place. There are two beautifully engineered bridges here: one high, soaring concrete curve, spanning the steep banks of the Duoro; one low, sweeping steel curve, skimming over the water. The view is downstream, towards the sea, and behind the chimney (top right) lies a hidden gem of modernist architecture, built in the late 1980s. I first became aware of the Faculty of Architecture by Alvaro Siza when I was a mature student, completing my architecture qualifications in Joburg, 25 years ago. It's a deceptively complex composition, resulting from the careful placement of rectan))gular blocks on a triangular site. From ground level it seems to be far more irregular than it really is. The Alfandega Conference Centre is an impressive combination of Metal and Granite, generally vey hard and tough but with the occasional extravagant decorative flourish. There are tram lines everywhere which were used to transport inported goods on low trolleys to their temporary resting places, awaiting customs clearance. The floors formed of shallow brick jack-arches spanning between steel joists are typical of fire-proof construction across Europe in the nineteenth century, as are the cast-iron columns. Everyone I spoke to was intrigued by the little round turntables wherever the tram-lines crossed. Porto itself is full of tall, narrow houses and steep, cobbled alleyways. Granite is the predominant material, sometimes plain and square, sometimes intricately carved and curvaceous. Everywhere there are balcony railings and ceramic tiles, both with infinite variations on decorative themes. The moorish influence is immediately apparent. I had one day to walkabout the old town with an umbrella before plunging into the BCS, a one day event focusing on "content", and bringing together manufacturers, designers and content providers. This is another little hobby-horse of mine. I think we should not be focussing on CONTENT as such, but rather on the role of manufacturers in BIM processes, and more particularly on how to enhance existing collaborations between designers and manufacturers using digital tools. Stefan Larsson of BIM Object gave a very lively keynote address, and the morning sessions generated some heated debate. It was my second time to meet Stefan, and I do think that BIM Object has made a tremendous impact in terms of alerting manufacturers to BIM. The BIM Supply initiative that they are about to launch looks especially promising to me and I really do hope it develops into a robust platform for interactive collaboration and data flow. The afternoon workshops were a bit of an anticlimax in my view. I'm not sure why. Perhaps the initial vision of using a forum like this to develop standards and protocols for object creation is a bit unrealistic. It's very valuable to bring people together and thrash ideas around, but moving on to formulat concrete proposals may be premature. My own position is that we have to get the collaboration processes right first, and that once manufacturers are using BIM-like environments to collaborate with designers they will see the value in continuously refining "BIM objects", in standardising datasets, improving interoperability, etc etc. As long as BIM objects are just another marketing gimmick they are providing to designers for free, we are not going to make substantial progress. But if they were to become essential tools for their own Specifications Advisors on the ground in every major city around the world, then I think they would become really motivated to ensure that they were really effective. So what about RTC ... the last ever RTC as it happens. Well it's only a name change really, but hopefully will continue the trend of opening up the conference to the wider BIM community. Personally I find the new BiLT acronym a little clumsy, and the logo ... well it's better than the old one, but I still shudder to think what my good friend Ian (a proper logo designer) would think. People complained about the internet, but for me the ambience more than compensated. Early evening breakouts by the riverside were just magical. These conferences are all about the people. Tips and tricks are svery well, but you can pick those up on the internet. The value of a really good conference is in the sense of being part of a dynamic community, converging from a wide variety of cultural backgrounds to indulge a shared passion. The North American conferences are great, but the European flavour is subtly different and I really enjoyed the experience. I had two sessions to lead, a whistlestop tour of Project Soane, and a Modular Doors Lab. I enjoyed them both in their different ways and received good feedback. I'm doing all this for my own benifit, primarily, and at 65 I'm not really looking to enhance my resume or gain international exposure. But it's nice to be part of a community and to feel that you are contributing something useful. Obviously I share some common ground with the European BIM/Revit croud, despite having spend more than half my life in Africa and the Middle East. It's a home-coming of sorts for a self-confessed global citizen. And of course the gala dinner was a fitting climax, followed by a visit to a little classic of modern architecture the next morning. Thanks again Porto, see you in Singapore next month, and perhaps in Arhus later in the year. PROJECT SOANE IS DEAD, LONG LIVE P.S. About a month ago something very strange happened. Nobody seems to know how, but most of the data on Project Soane was wiped clean. I didn't realise this until last week when two project members alerted me. Over the past few days, with help and support from Autodesk, I have restored the site, taking the opportunity to reorganise it with the benefit of hindsight and a much deeper understanding of the building, the architect, the historical period. There is a folder called "Current Sheets" which will be updated from time to time. This contains images exported directly from the sheets in the main model file, plus a few other images that help to give newcomers a snapshot of the current state of the model and some insight into what has been achieved. The Reference Material has been completely reorganised in a folder of that name. I think I have re-posted all the original hi-res material sourced by the project founders from the Soane Museum in London. Let me know if you notice any omissions and we will try to sort it out. There is also a lot of additional material, mostly slightly lower resolution, much of it downloaded from the Soane Museum online archive, which is THE MOST AMAZING RESOURCE. Please be aware that copyright for most of the images still resides with their original owners. They are provided here under the original agreement with the Soane Museum for private study and research purposes. Please respect this at all times. I have created a new folder called "Stories" where people can share work they have done which extends the core modelling project in some way or other. I have started this off with a subfolder called "Timeline Images" which are exported from various study files that I have created over the past 2 years or so in order to better understand the sequential history of this very complex project. I have also made my first foray into the Wiki Pages section, which was originally set up by the project founders, adding a note to the welcome page, for example. As you may know, the model is now hosted on C4R, so you no longer have to download and re-upload in order to contribute. Everything is 2017 version by the way, and please ensure that you have the latest updates installed before opening anything. If you want to contribute, please leave a message on the site, and we will come to an agreement about allocation of responsibilities. I made an excel file to record activity which will be restored shortly, hopefully in a way that enables direct editing of the worksheet. But my major contribution to the Wiki Pages is a new page based on some of the Timeline images. This gives an overview of the architectural history of the Bank from its foundation to Soane's retirement. Future pages will go into a bit more detail and extend the period into the early twentieth century when most of Soane's work was demolished to make way for a design by Sir Herbert Baker. So every cloud has a silver lining, and this little cloud catastrophe has given me renewed inspiration and energy to take Project Soane to the next level. Why don't you get involved. Many people have contributed to the project, not just by modelling but in all kinds of ways, the original founders deserve a very special mention for example. There were many submissions for the rendering stage of the project and I would like to integrate this work more fully with the A360 site where collaboration is ongoing. So there are many ways to participate. 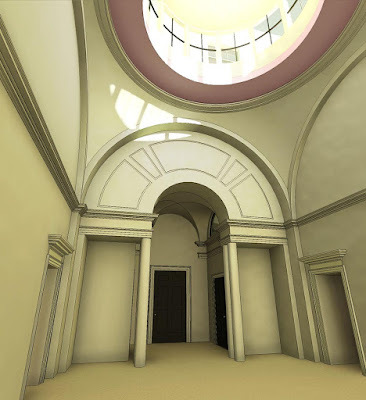 There is at least one student currently developing a project based on the site, and inspired by the spirit of Project Soane. I would really like to incorporate initiatives of this kind into the Stories section. So how would you like to contribute? Lots of possibilities. Think outside the box. Give me a shout. It's strange really how we develop loyalties to brands. I took an interest in the Mac very early on, when it was still a funny little box with a monochrome screen, (and Windows didn't really exist yet). But based in Africa as I was, I could never afford one and gradually I grew tired of all the hype, the smug superiority and ultimately developed something of an aversion to all things Apple. It was a similar story with Archicad. I dabbled very early on, long before Revit came on the market, and could so easily have become a faithful devotee. But life took a different turn and ended up a Revit junky. I was a bit late to jump on the touch screen band wagon and when the time came I opted for a "Windows ecosystem" I took to Windows 8 from the beginning, and never really understood the fashion for Microsoft bashing. But it's no good complaining about other people's prejudices if I'm not willing to tackle my own. So early last year ago I bought myself an iPad. Three birds with one stone: a new sketching device, access to Autodesk apps, put my prejudices to rest. The apple pencil has been a bit disappointing, but there are many positives. Ironically, the Microsoft apps are especially good. Emboldened by this I recently replaced my work Blackberry with an Android version. I still love my Windows phone, but not enough people agree with me to support a full range of So I am enjoying having feet in all 3 camps, and this weekend I found myself taking another look at the iPad Formit app. It started off as something to do as I lay in bed with a dose of flu. I downloaded site imagery for the Bank of England and started to mass out Soane's Bank from memory. This was more by accident than design, but I soon realised it was a very positive learning experience, making me think harder about proportions and relationships, testing my understanding, raising new "WHY" questions. To record these observations, I decided to open One Note on my Blackberry. It seemed less disruptive to my train of thought than switching apps, kind of a poor man's version of the dual screen. All the while I was learning on two fronts simultaneously: gaining fluency with the iPad user interface for Formit while probing my understanding of the basic massing of the bank. This was something I tried to do when I first started Project Soane, but it's very different coming back to it almost two years later. The difference between sketching to explore something totally new, and sketching to crystallise, summarise long familiar material. If Renaissance Revit was about symbiosis (the positive feedback loop of two intertwined explorations) Project Soane has become an entire ecosystem. Architecture, Social & Economic History, BIM tools & Processes, Soane himself, the Industrial Revolution, the functional organisation of the bank. The interaction between these mental domains has been very exciting for me. So why can't the world of push-pull modelling become another element in the mix? Of course there is a downside. All those awkward little wedges that have to be cleaned up for example. How well I remember those. And I find myself asking why am I doing this in Formit? It's less precise than Revit. I'm drifting away from the "single source of truth" approach. So how will this help me? Isn't it duplication of effort? 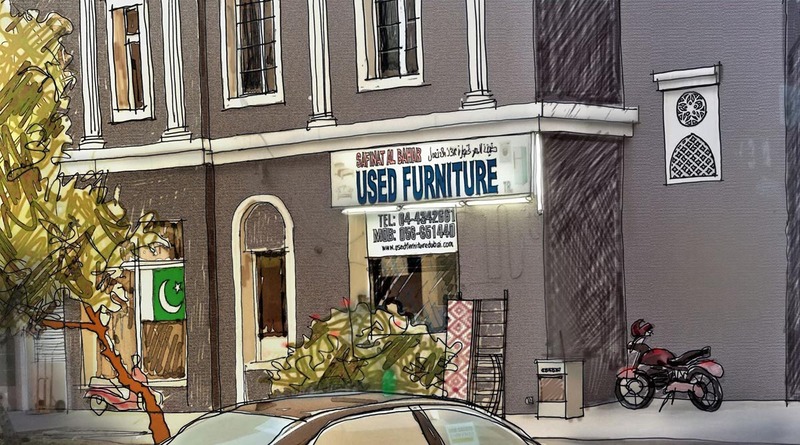 What is the point of sketching in a BIM world? But practice makes perfect. And of course there is value in starting from scratch, in rebuilding something from memory. The guessing game is revealing. I have talked before about the insights that come from playing a guitar song on the piano. There's something of that in this exercise. Working from memory I make mistakes, and the nature of those mistakes can be revealing. Sketching is about keeping things loose, letting subconscious intuitions come to the fore. But those intuitions are also honed by practice. I am rediscovering lost skills: the ability to judge proportions by eye, for example, instead of forever typing in a dimension. Sadly my attempts to hand sketch over exported images from Formit are rather disappointing. Not sure what value this is adding. Still, let's soldier on, Rome wasn't built in a day after all. Try to learn from my mistakes. Loose sketching isn't always the answer that the situation demands. When I was a teacher, I was always looking for activities, to create opportunities for "learning by doing". Drawing from memory was one of my favourites: a way to stimulate deeper questioning by setting up a kind of game. You soon find out whether you have really grasped a concept if you try to encapsulate it in a diagram. Some years ago, when I was travelling regularly to Mozambique, Malawi & Botswana I started playing this game with the Map of Africa. So it occurred to me that it would be fun to try this out on the iPad. This was around the same time as the Sketchup work I showed earlier, and I hadn't attempted it since, so I was quite chuffed with the results. So I thought "why not do a second version by tracing over an actual map?" This turned out to be quite a useful way of practising control of the tools, and I was inspired to process the result in a number of ways: inverting the image and filling the boundaries to highlight countries in different colours. Using layers to isolate the elements and export alternative versions. Finally I decided to make a second sketch from memory. Aided by the simplest of grids, dividing the sheet into 4 quarters, I was able to draw a much better outline, fresh as I was from the tracing exercise. I tested this by overlaying the traced fill. This reveals where my mental image is still wavering, but on the whole, the relative sizes and proportions are pretty good. So why not take a similar approach to Project Formit. Take a plan exported from Revit and make a second, more accurate model of the Bank. 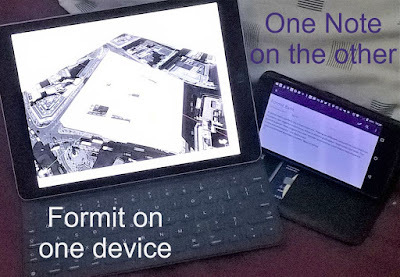 For this I switched to the Web version of Formit and took notes as I went along using my Windows phone. Might as well make the most of this idea of switching toolsets and approaches to gain fresh insights. I started with a simple extrusions, applied a translucent material and switch to a top view to begin tracing the internal structure. As the work progressed it was useful to add opaque colours to the completed elements so I could see the form more clearly. So what did I learn? The simpler, more abstract form highlights the contrast between Taylor's set pieces and Soane's intricate jigsaw puzzles. It's partly a difference in temperament of course, but also I think of the complexity of the planning issues they faced. Another thing that comes out quite clearly in the green zone, is the increasing intensity as you approach the directors parlours. That was really the nerve centre of the Bank, so it's quite satisfying to see it expressed in a diagram like this. Clearly there is a lot of value in abstraction: in drawing & modelling something repeatedly and boiling it down to its essence. This also showed up when I started to map out the rhythms of the Screen Wall Elevations. They are rather easier to understand when you strip away the excess detail. Once again I am reminded of my desire to do this kind of analysis right at the beginning of my efforts. But of course it's not so easy to do when you haven't yet come to grips with your subject matter. And so I continue to ask the question of how to bring a more intuitive, free-flowing approach to the world of BIM. So far, Formit has been an occasional diversion, rather than a regular counterpoint to Revit (my trusty BIM pencil) but maybe that can change. Maybe I can find useful bidirectional workflows. Digital sketching also remains tantalising & elusive. Perhaps it will never be "just the same" as drawing on paper, but it doesn't have to be. However I do need to find ways of more quickly and easily achieving results that I find deeply satisfying. It needs to become a more transparent medium for visual thinking.